When I got off the shinkansen at Tokyo Station it was already evening. I found my way to Hatchobori (tricky because it meant transferring to the Keio Line, which meant walking over 500m inside the huge train station) and the Unizo Inn there. I didn't really have any tourist activities planned there; I just slept, and in the morning made my way back to Tokyo Station, then Nippori Station, took the Skyliner to the airport, and then a long drawn-out series of flights, Narita to Incheon to Vancouver to Toronto. I got out of the Toronto airport at 01:00 and then had to find my way to my hotel, the "Four Points by Sheraton" on Airport Road. This was complicated by the fact that there also exist a Four Points by Sheraton Mississauga; a Sheraton Gateway; and a Four Points by Dixie, all in close proximity. The first shuttle bus I tried to get on was for the wrong hotel, and when I eventually got on the right hotel shuttle bus, one of the other people onboard was someone who had actually gone to some other hotel first by mistake before correctly getting onto that bus. I slept the rest of the morning in the hotel, trying to get a little better onto Toronto time, before heading into town to move into my apartment. That was the 3rd. It is now the 7th. I've spent the last few days gradually getting things sorted out and set up. Completing the process will take a long time. I have possessions in Skanör, Sweden; Winnipeg; and Hamilton, all of which will have to find their ways to me one way or another. I donated almost all of my furniture to charity when I left Winnipeg, and I gave most of my kitchen equipment to my friends who were holding onto my stuff in Sweden during my time of homelessness, so I have to buy a bunch of new stuff. I also have to deal with all the paperwork of establishing a residence here. Internet service was basically the top priority, and that just came in on Saturday. Today I'm stuck here waiting for UPS to deliver a bunch of equipment and supplies I will need for my synthesizer business - storage containers, packing material, shipping boxes, zipper bags (plain and ESD-shielded), and so on. It's become clear to me that each of my long-distance moves has a theme song, not entirely of my choosing but sort of emerging from what happens. For Toronto to Winnipeg in 2010, it was 星の生まられる日. Winnipeg to Copenhagen in 2014 (maybe technically a move within Winnipeg preceding that, but they were part of the same transition), it was Brand New Breeze. And for this move back to Toronto, well, the theme song is definitely You Can Call Me Al. It looks like spinning up the business is going to take longer than I had hoped. Not only do I have to get all my possessions here, and some new furniture and equipment, but there are going to be delays sourcing parts. 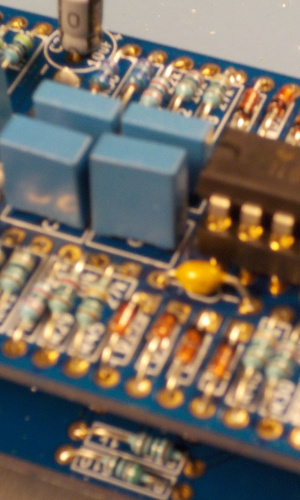 In particular, it may take two months of lead time (after I place the order, which in turn should probably wait until I have the corporation registered) to source production quantities of the panel potentiometers for the Leapfrog Filter, which is planned to be my flagship product. So that won't happen this calendar year. I may be able to get a few of the parts sooner for final prototyping, but it looks like when I first go live with the store, I won't be able to have Leapfrogs in it. Instead I'll be going with the sine oscillator (discussed in my video streams) first, and maybe the octave switch at the same time or maybe a little later. I also have to deal with sourcing knobs for the Leapfrog, and I think they'll have to be at least partially custom-manufactured.